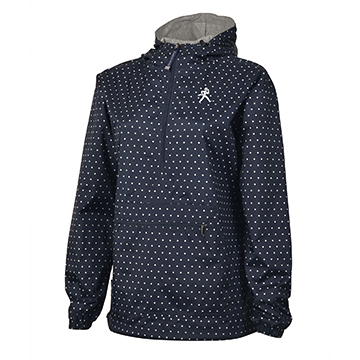 Ladies jacket in navy features white polka dot pattern, white Ichabod embroidery, and zipped kangaroo pocket. Shell: 100% Polyester, Lining: 65/35 Polyester/Cotton. Made in United Arab Emirates. Please select option for Jacket - Ladies Charles River Polka Dot.